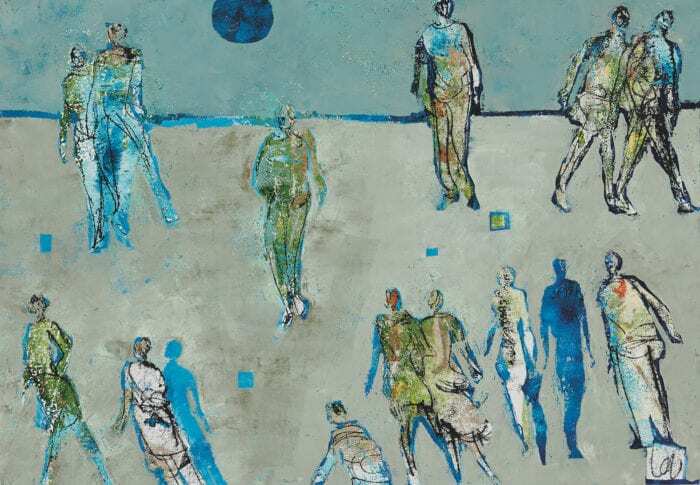 Present in Absence, an exhibition of monotypes by Louise Almon, will show at the Candice Berman Gallery in Johannesburg from 28 September to 12 October 2017. 'What is the city but the people?' Coriolanus asks in the tragedy, Coriolanus by William Shakespeare. 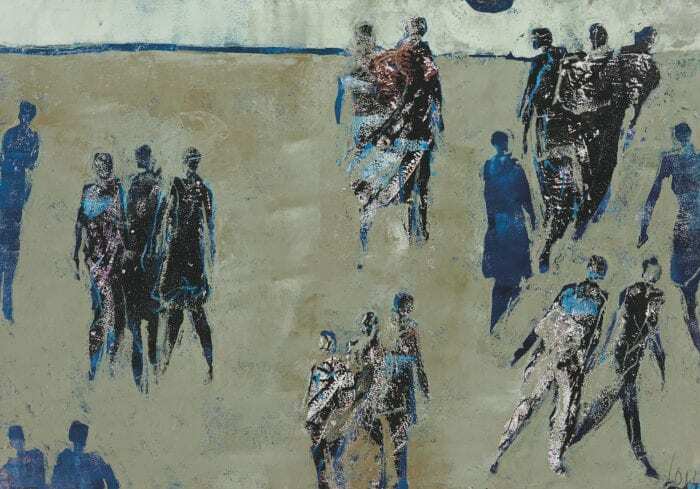 Although Louise Almon trained as a painter, she is currently working primarily with monotype prints. Both mediums use pigment - and both are unique one-offs. Although painting can incorporate the element of chance and spontaneity to a certain extent, the monotype is considered the king of spontaneity and combination. Many famous artists have chosen this method, including the 18th-century mystic William Blake - who is considered one of the most important artists to use this medium - as well as Pierre Bonnard, Pablo Picasso and contemporary artists such as Tracey Emin, South African icon Robert Hodgins, and Cape Town-based artist Georgina Gratrix. In a nutshell, the monotype print technique involves a non-absorbable inked or painted surface which is transferred onto a piece of paper, the outcome of which is not repeatable. While Almon is never sure of 'how it's going to work out', she still has the control of being able to 'rework the image again and again', often working on both sides of the print until it meets her specifications. She uses a high-quality, 200-gram paper that can cope with the weight of the ink and the pressure of being worked upon. The monotype is a sensual medium which draws attention not only for its particular mark-making but also the inks themselves. In the monotypes that make up Present in Absence, there's a sense of Almon's slow shift from the specifically political paintings and murals of the 1980s through to the hot, bloody tones of the Marikanaseries, and a less overtly political, generalised approach to humanity. The busy, congested atmosphere seen in her Paris series has given way to a simplified, cooler, more spacious rendition of people and their relationship with the city. Almon's figures are often shown from above, suggesting an even greater sense of detachment. This depiction was partly informed by the elevated situation of her Fordsburg studio in downtown Johannesburg, which provided a bird's eye view of the cityscape below. Interestingly, Fordsburg with its shops and factories was originally built as a home for miners working on the Johannesburg gold reef. Whether the relationship with the city manifests as a search for work from abroad and rural areas or the search for an identity, it is very much part of the historical South African experience. The Natives Land Act of 1913 forced black South Africans off the land of their forefathers to serve in the mines, factories and homes of the ruling white minority. As a result, they started to populate the cities and outlying urban areas. Wars and famines in the surrounding countries of the African continent have also forced many people to find work and safety within the South African borders. Despite this, the human brain is apparently not structured for living in city environments. Studies have shown that urban living raises the risk of anxiety and mood disorders. 'If social density and social isolation come at the same time and hit high-risk individuals … then city-stress related mental illness can be the consequence,' says German clinician and researcher Mazda Adli in the Guardian article, 'Sick cities: why urban living can be bad for your mental health'. Almon contextualises her title Present in Absence by suggesting that the figures in cityscapes may be present but also disconnected, even the ones shown embracing. In a sense, presentness always carries its opposite, absence. 'You might be present in the city,' she explains, 'but your heart lies in another country or in the rural areas. You may have left someone behind or have lost someone.' The subject matter of Present in Absence finds a parallel in the monotype print technique. For Almon executes lines, marks and manipulations in the absence of the initial colouring and design. And it is these negative spaces which hold or contain the figures. Almon believes that 'it is in these in-between spaces that the energy is most keenly felt, and most present in its absence.' There is also a sense of paring down in these monotype prints, where the artist has moved from the clutter of detail to bare essentials. She cites this as possibly being part of her maturing process of needing less and saying less. Almon is very clear, however, that the subject matter of Present in Absence is not only about the negativity of alienation but the inclusion of a particular stillness. There is also another level to this presentness; although Almon may not depict herself in these works, she is profoundly present in them, as their creator. In keeping with the wish of most artists, Almon hopes that the viewer will resonate with the work in Present in Absence so that they will have a sense of or a feeling of recognition of this aloneness and the stillness that comes with it. Although she has no concrete sense of future work, she is very drawn to the quality of the light in Cape Town and how it differs from the light in Gauteng, from where she moved at the end of last year. Almon is currently exploring and engaging with it.